September is finally over. Which can only mean one thing...Bring on the scary movie marathons and TV shows! Not just the new ones but the classics such as George A Romano’s Night Of The Living Dead, or how about Alfred Hitchcock’s Psycho who starred Janet Leigh, the mother of…Jamie Lee Curtis! We also have some scary movie films for you that are not in black and white such as, Friday the 13th, A Nightmare on Elm Street, Stephen King's IT, The Nun, and Annabelle. 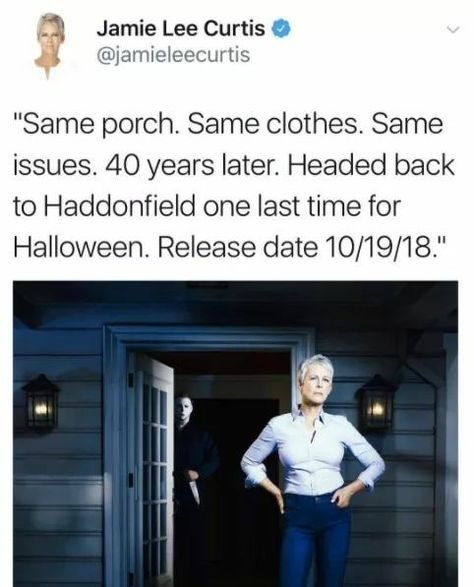 How will this work with Laurie Strode? When Jamie Lee Curtis last played her role in the Halloween franchise, she died by the hands of her brother Michael in Halloween: Resurrection. So, what did the franchise do to bring back their MVP one last time? The film will pick up where it left off with the Halloween II 1981 film. Also, they will disregard Laurie Strode being related to Michael Myers, which will be interesting to see how that plays out. From what the trailer shows us and what we dug out from it, 40 years ago Laurie Strode survived an attack from Michael Myers on Halloween night. He was locked up in a mental institution afterwards and managed to escape during a bus transfer. Michael returns to Haddonfield, Illinois to finish the job and kill Laurie Strode. She was waiting for him though and the two will go head to head to end each other. Laurie is determined to finish the job once and for all. The trailer for the film will make you go wow! New music from John Carpenter the director of the first film and co-writer of the first 2 films in the franchise, upgraded Michael’s theme music and oh, is it haunting! Listen for yourself and see if that doesn’t give you chills and take you back to 1978 when the first one came out when scary movies weren’t just blood and gore but suspense and thrill! 40 years ago, John Carpenter gave us a beautiful film to watch to shock and awe us. Now, Halloween III is coming out to complete the story and fill in our gaps. We have the amazing Jamie Lee Curtis reprising her role as Laurie Strode but also Nick Castle, who will also reprise his role as Michael Myers, something he hasn’t done in 40 years! Also in the spirit of Halloween, I put out a top 5 scary movies to watch for you all...in case you need some encouragement to get into the Halloween spirit!